People with disabilities may encounter difficulties with many activities of daily life. Depending on the level of disability, this can occur during a trip to a supermarket , where it may be difficult to remove items from a shelf while seated in a wheelchair which is why some relative of people with certain disabilities choose to take a medical assistant courses so they can better help their loved ones. Packages may be difficult to open. Movement within a residence, or public travel, may require specialty equipment, disability access, or personal aid. Medical equipment may have to be specially designed for those with disabilities. Beds may need special accessories. Showers and bathtubs should have additional safety rails and other methods for easy access. Of course, the wheelchair is a specially designed device to offer better mobility for those who cannot walk. Even a wheelchair may come in a wide variety of different formats for specific levels of disability. Motorized units provide additional independence. Some chairs are designed for especially large people. There are often situations where medical care requires the weight of a patient to be known. There may be a need to ensure that the patient does not have excess fluid retention. It may be necessary to determine if an adequate nutritional level is being met. Weight may be an important factor in selecting the specific medications, or the dosage levels that are required. 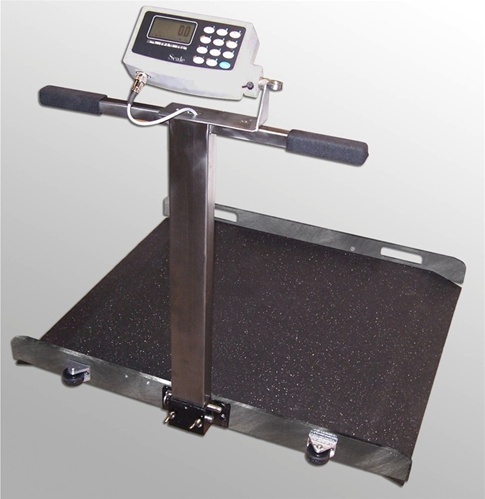 Wheelchair scales are specially designed electronic scales that are meant to provide this type of information. These digital scales must provide accurate weight, and must be able to display this weight in an easy to read format. Most importantly, the wheelchair scale must provide a large, stable weighing platform with easy access for the wheelchair. In some medical center situations, it may also be desirable to record the patient weight, and to send this data into a central database. These weighing scales must be very rugged and reliable. Many of the professionally built wheelchair scales are based on designs used for industrial scales. Typically, they may be a platform scale that has been modified for this specific use. Generally the platform must be quite large, and have a very low profile. These electronic scales utilize load cells in each corner of the scale platform to convert weight into electronic format. The load cells must be particularly capable of withstanding impacts that may occur if the wheelchair is pushed against the side of the scale. This may easily happen if the wheelchair patient is being positioned to be wheeled up the ramp of the scale. This type of side impact can easily damage a load cell if it is not properly designed for this. Most industrial scale load cells are fabricated from either aluminum or nickel plated steel. Unfortunately, both of these materials do not withstand shock loads very well. They may be easily deformed by this type of load. Some electronic scales, including those manufactured by Arlyn Scales, are built with load cells that are machined from stainless steel. The stainless steel alloy employed for this purpose has a much higher modulus of elasticity, which provides significantly better protection from side loads. After the stock material is machined into a load cell, it receives a further heat treating process to provide even further protection.